NEW WORLD WAR II HISTORY REVEALED!! 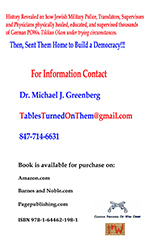 IN "TABLES TURNED ON THEM-JEWS GUARDING NAZI POWS IN THE UNITED STATES"
PURCHASE A COPY OF THE BOOK "TABLES TURNED ON THEM-JEWS GUARDING NAZI POWS IN THE UNITED STATES"
IF YOU LIKE THE BOOK, PLEASE PROVIDE A REVIEW ON AMAZON AND/OR BARNES AND NOBLE. PURCHASE A COPY FROM PAGE PUBLISHING: LINK IS___. This gallery features a description of the book "Tables Turned on Them, Jews Guarding Nazi POWs in the United States". “Michael Greenberg discovered an important topic that deserved to be examined at much greater length. The concept that the US Army would put Jewish soldiers in charge of Germans- some strongly pro-Nazi- prisoners of war is not widely known. “ “Greenberg wanted to chronicle his father’s experience as a Jewish GI assigned to guard German POWs at Camp Clinton, Mississippi. -Derek Mallet PhD, Assistant Professor of Military History, U.S. Army Command and General Staff College, Department of Military History, Augusta, Georgia. 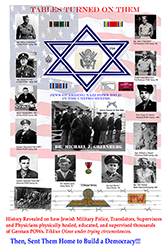 “The astounding story Mike Greenberg uncovered about Jewish GIs from Chicago guarding Nazi prisoners of war in domestic internment camps in World War II has legs as another Memorial Day passes by. -George Castle, Reporter, Chicago Jewish News, April 1 and June 3, 2016 Issues. As the systematic murder of six million Jews by Nazi Germany and its collaborators was taking place, Jewish soldiers in the United States Army participated in the guarding, healing and reeducation of some of the 372,000 German Prisoners of War (PW) held in camps scattered across the United States. This book tells the true stories of thirty-one Jewish GIs who were “enablers “and “change agents”. Rather than take revenge on former enemies, they treated them as victims of Nazi indoctrination to hate, and deprogrammed them through one on one interaction and formal educational and cultural programs which affected thousands of PWs. One GI, John Neumaier reached approximately twenty thousand PWs at the Fort Eustis Re-Education program. Jewish GI doctors healed hundreds of PWs from a range of physical ailments which showed Jews cared about Germans, regardless of politics. Almost sixty years after treatment, one wounded PW, Detlef Teske, in a taped interview with the Imperial War College in London, remembered the great treatment received from surgeons Harold Bellin and Raymond Harris at the Clinton POW Camp Station Hospital. PWs Gustav Jochem and Josef Huber worked at this hospital with the permission of Jewish commanding officer, Major Harold Bellin. The experience motivated both PWs to become medical doctors after the war, and they joined fellow PWs at reunions held at their former camps where they recalled with great fondness, the wonderful treatment received from Jewish GIs. 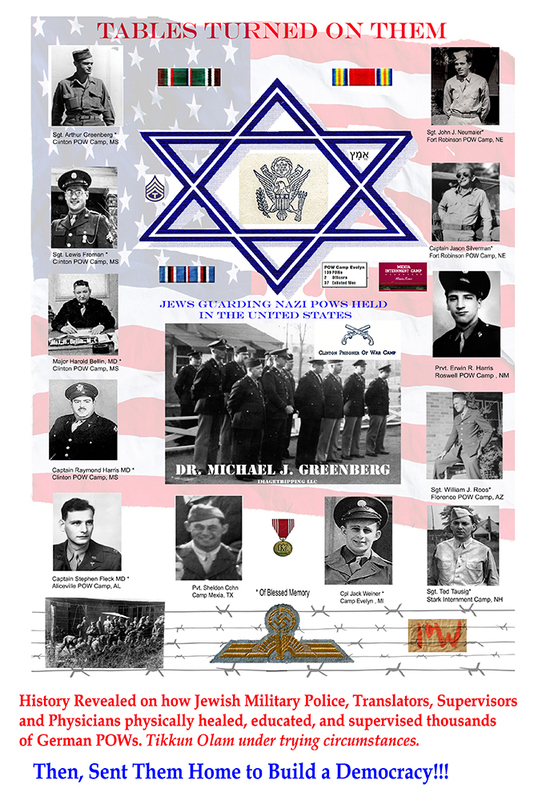 In “Tables Turned on Them- Jews Guarding Nazi POWs in the United States”, Greenberg offers an eloquent tribute to these GIs as unsung heroes, and role models who displayed a sense of justice, humility, civility, and perseverance during their tours of duty. He reveals the motivations of these GIs to perform a verbal Tikkun Olam (repair of the world) with the Nazi PWs, despite the dangers of going into PW compounds unarmed, experiencing anti-Semitic taunts, and how these experiences affected the GI’s post war lives. With anti-Semitism now on the rise in the United States and Europe, the Jewish GIs described in this book become role models for our children and grandchildren on how to positively respond to this rise in racism.